Those fancy entry locks with the touch-sensitive numeric keypads are so 2012. Kwikset’s new Kevo deadbolt quizzes your iPhone to verify that you’re authorized to enter, and then unlocks when you physically touch it. Kwikset licensed the technology from Unikey Technologies. I recently spoke with UniKey CEO Phil Dumas to learn how the Kevo works. Kwikset's Kevo lock is currently compatible only with the iPhone 4S and iPhone 5. Your phone can stay in your pocket or purse, according to Dumas, so if you’re already juggling an armful of parcels, you don’t need to pull it out to unlock the door. As long as it’s close enough to the lock, a simple touch of your hand is enough to open the lock (a ring around the lock glows blue once it establishes a connection with your phone). 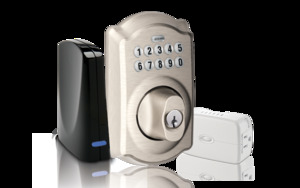 Physically installing the Kevo shouldn’t be any more difficult than installing any other entry lock. I’ve installed keyless entry systems from Kwikset, Schlage, and Yale and they’ll all been a piece of cake. The process Dumas described for configuring the lock to work with your phone, on the other hand, sounds much easier than other locks I’ve reviewed. After you install the UniKey app on your phone and press the Enroll button on the back of the Kevo, “you just need to walk up to the lock and touch the phone to the lock,” said Dumas. “Launch the app once and you’re done.” There are no PINs or passwords to remember. Authorized users with a supported phone or the key fob can lock the door with one touch. Visitors leaving your home who don’t have either can lock the door with a triple tap. 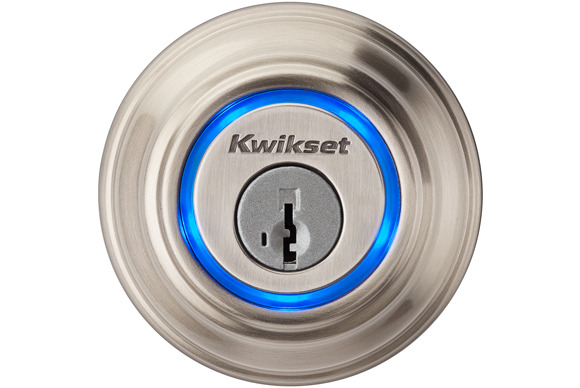 The lock is powered by four AA batteries, which Kwikset estimates should last one year. The app has a battery-life indicator, and the lock can send notifications when the batteries need to be replaced. 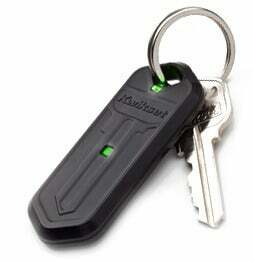 Kwikset will also provide a Bluetooth keyfob, in case you don't own an iPhone. Unlike many other entry-level home-control systems that support keyless entry locks— Lowes’ Iris and Nexia Home Intelligence being two examples—Kwikset won’t be attaching any subscription fees to Kevo locks. You can enroll one iPhone for free (only the iPhone 4S and the iPhone 5 are supported), and you can send an electronic key to a second iPhone. You can also purchase additional revocable keys for $1.99 each. Don’t have an iPhone? Kwikset provides a keyfob that works in the same way. If you lose your phone, you can log into the Kevo app on another phone or into the Kevo web portal and delete or disable any eKeys associated with the lock. UniKey plans to add support for Android and BlackBerry phones in the near future. If you want services beyond that, however, you will need to sign up for a subscription. UniKey plans to develop a wireless bridge that will enable you to program and control the lock via the cloud. The services Dumas described sounded very similar to Nexia Home Intelligence: “You’ll be able to send unlimited keys to other phones, and there will be timed-access keys for things like a maid service. You’ll have unlimited notifications when someone arrives home—or doesn’t arrive home. We’ll have remote lock and unlock capabilities.” Dumas went on to say that the subscription element has not yet been fully defined. The free Kevo features will be enough for some, but I would want to be able to tie the lock into my larger home-control/home-security system. One other detail Dumas wasn’t available to provide before we published this story: Price. I expect it will be in line with current touchpad locks that can be included in home-control systems such as ADT, Iris, Nexia Home Intelligence, and Vivint. Those locks range in price from $200 to $275, but we won’t know until the unit goes on sale. I’ve requested an eval unit and will follow up with a hands-on review as soon as I receive it.